Power amplifiers and their performance lie at the heart of audio engineering and provide some challenging problems for the engineer. Ben Duncan's experience, as an audio consultant, analog electronics designer and author, give him an unique insight into this difficult but rewarding field. 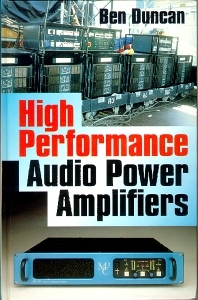 Linking analog electronics, acoustics, heat and music technology; high-end hi-fi and professional PA and recording studio use; theory, modelling and real-world practice; design and repair; the old and the new, the mainstream and the specialised, this comprehensive guide to power amps is a core reference for anyone in the industry, and any interested onlookers. Ben Duncan is well known to many users of audio power amplifiers around the world, both professional and domestic, through his articles, reviews and research papers on music technology in the UK and US press, and through his part in creating several notable professional power amplifiers. Since 1977, he has been involved in the design of over 70 innovative, high-end audio products used by recording and broadcast studios, on stages, in clubs and by the most critical domestic listeners - as well as creating bespoke equipment for top musicians. Born in London, he has travelled widely but has lived mainly in Lincolnshire, home of his family for over 150 years. He is twice co-author of the book Rock Hardware in which he has chronicled the history of rock'n'roll PA.
Ben Duncan is well known to many users of audio power amplifiers around the world, both professional and domestic, through his hundreds of articles, reviews and research papers on music technology in the UK and US press, and through his part in creating several notable professional power amplifiers.Since 1977, he has been involved in the design of over 70 innovative, high-end audio products used by recording and broadcast studios, on stages, in clubs and by the most critical domestic listeners - as well as creating bespoke equipment for top musicians. Born in London, he has travelled widely but has lived mainly in Lincolnshire, home of his family for over 150 years. Outside a wide spectrum of music and festivals his interests include managing an organic garden, woodland and nature reserve; industrial archaeology, historic building restoration, psychic research, and 20th century political, social and engineering history. He is twice co-author of the book Rock Hardware in which he has chronicled the history of rock’n’roll PA.
International consultant in high quality Audio Electronics, Pro & Hi-Fi; and prolific equipment designer. See Ben Duncan Research websites.